Three Cudahy elected officials have agreed to plead guilty in a federal case involving extortion, bribery and election fraud. Speaking through his attorney Thursday, former city councilman Osvaldo Conde, 50, apologized for his actions in a federal case involving extortion, bribery and election fraud. “Mr. Conde feels bad about what he did,” said Manny Medrana, Conde’s attorney. Conde refused to surrender to police last month, leading to a four-hour standoff while he barricaded himself inside a business he owned. A trio of city officials accepted plea deals in the on-going Cudahy corruption scandal and admitted to taking bribes in exchange for their support of marijuana dispensary permits. 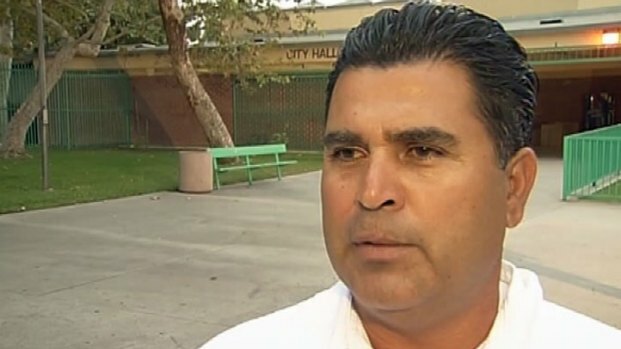 Former Councilman Osvaldo Conde on Wednesday became the latest Cudahy elected official to plead guilty to bribery and extortion charges. Ana Garcia reports for the NBC4 News at 5 p.m. on July 18, 2012. The 50-year-old became the third Cudahy city official on Wednesday to reach a plea deal with prosecutors, agreeing to plead guilty to one count of extortion and one count of bribery, according to documents released by the U.S. Attorney’s Office Wednesday. According to plea agreements, at least one of the men discarded absentee ballots that were not in favor of incumbents during elections in both 2007 and 2009. Conde won one of those elections by 33 votes. Former Cudahy Mayor David Silva and former City Manager Angel Perales have also reached plea agreements with federal prosecutors. Cudahy Candidate Who Lost: "Vindicated"
After allegations of election fraud surfaced in court documents, Luis Garcia, who narrowly lost a council election, remembers the 2007 contest. Ana Garcia reports for the NBC4 News at 5 p.m. on July 13, 2012. The three were slated to be arraigned Thursday, though they will not formally enter their guilty pleas until next month. Members of the activist group CAUSA were also in court Thursday calling for all Cudahy city council members to step down, claiming the results of the rigged election should be discarded across the board. The drama started in January and February, when a confidential FBI informant pretended he wanted to open a marijuana dispensary in Cudahy, according to court documents. The councilmen said they would support a proposed pot shop in exchange for money.